April 10, 2018 - A 12-storey building inherently different than any other in the city will soon rise on Toronto’s eastern waterfront. A rendering of the building on Toronto’s east end. George Brown College revealed final plans April 3 for the province’s first tall institutional wood building. Two Canadian architecture firms – Moriyama & Teshima Architects and Acton Ostry Architects – will design to showpiece structure. 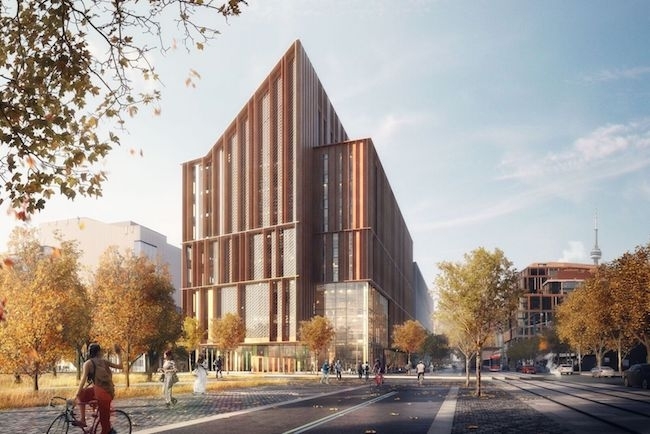 Dubbed the Arbour, the building will serve as a campus building for the downtown Toronto college and house 16,250 square-metres (approximately 175,000 sq. ft.) of floor space. It will cost about $130 million to build. Geroge Brown picked the winning design team from a field of four finalists, determining the winner based on the innovative use of wood, energy use and building resilience, among other factors. Vancouver-based Acton Ostry also recently completed work on the 18-storey Brock Commons Tallwood House at the University of British Columbia. Recent advancements such as special cross-laminated timber plates – which function like concrete slabs – have made taller wood buildings feasible. The innovative approach is seen as both sustainable and supportive of broader Canadian industries. Building codes in several provinces, including B.C., Ontario and Quebec, have been amended to support the new type building. Crews are expected to begin work on the structure on a 0.23 hectare site at Queens Quay East and Lower Sherbourne Street in 2021.